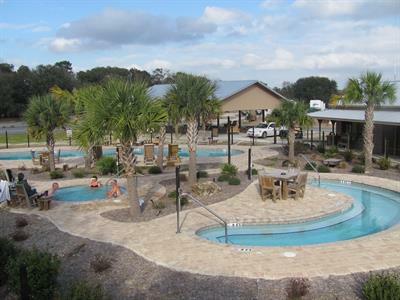 Amid an unspoiled forested area you'll find the right place to spend your time at Suwannee River Rendezvous Resort and Campground. 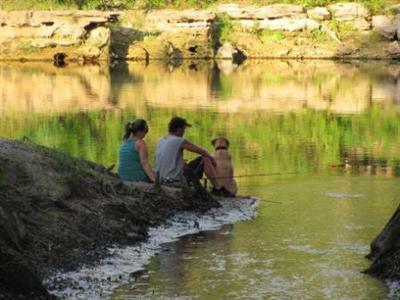 Choose RV and tent sites with beautiful river views, picnic tables, graceful oak shade trees and plenty of room. A picnic pavilion and playground add to the fun. If a log cabin is more to your liking, there are two that sleep six people. There's a bedroom with a double bed, a loft with a double bed, and a sleeper sofa. Each cabin is equipped with A/C and heat, private bathroom, satellite TV, small kitchen with appliances and linens. 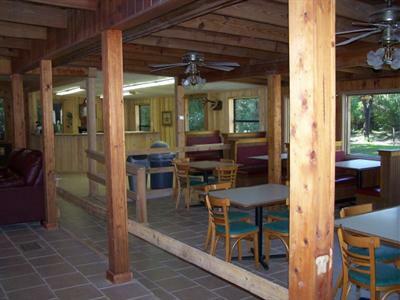 Ideal locations for big family gatherings are the Suwannee River Rendezvous chalet, A-Frame and Tree House. The A-Frame has a delightful wraparound porch on the Suwannee River. Up to 10 people can be accommodated, with two bedrooms, a sleeping loft and two sleeper sofas. Cook for a crowd in the full kitchen, stocked with pots and pans, and serve those meals to hungry guests in the dining room. The chalet, surrounded by live oaks, also has a large screened in-porch. Gather around the fireplace when it gets chilly. It comes with a master bedroom, guest bedroom with two queen beds and a sofa sleeper and kitchen. The Tree House is not really a tree house but it is elevated so the view from the windows is in the trees. It sleeps 10 with 3 bedrooms and two baths and a huge covered porch. 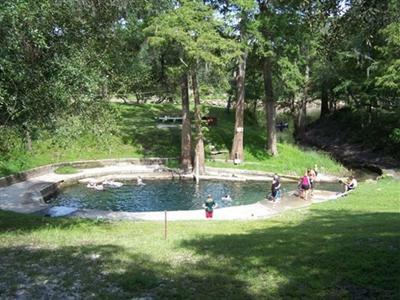 Rise and shine to the sight of the Suwannee when you stay in the river rooms. Depending on the level of the water, you can fish from your patio. The Hill Top Motel offers affordable lodging and a large covered porch. Lodge rooms above the office provide river views and private patios. The spacious suite sleeps six and comes with a kitchenette. Colorful camellias bloom outside the Spring House cabin, which features a king bed, private bath, kitchen and patio with built-in fire pit. Take a break from fixing meals and stop in at Grandma Susie's Cookin' Shack. Breakfast, lunch and dinner are on the menu, open Friday through Sunday. Pick up a pizza, dig into a sirloin and top it off with a hot fudge banana sundae. Drinks and ice cream are available throughout the week. Make the park's lodge your must-stop location for entertainment. Test your knowledge of trivia in the weekly competitions, use the free Wi-Fi, dance along with live bands and sing the hits during karaoke sessions. It's easy to enjoy activities on the Suwannee River with a variety of canoe and kayak rentals offered right at the park. Helpful employees with pick you up and drop you off, or you can just fish and paddle off the boat ramp.